My husband and I will be landing at JFK on the morning of Oct 5 for an overnight stay before our international flight on Oct 6. We have a reservation at the Fairfield Inn at the airport and would like to see a few sites during that day. That particular hotel is 4-1/2 miles from the nearest subway station, so you'd have to take a taxi to the subway. Accessing the 9/11 memorial and the Ellis Island/Statue of Liberty ferry is easy -- about 35 minutes by subway. A cab ride from JFK one way with tip, tax, and tolls will be $75. If you stay at the airport you will waste a lot of time traveling. Also please note a trip to Ellis Island and the Statue will occupy the entire day. What time is your flight out on the 6th? And is your reservation at the Fairfield cancelable . . . I accompanied my husband on a business trip to NYC in early March, and I spent a day going to the Statue of Liberty and Ellis Island. I had been to the Ellis Island previously at least twice, but never to the Statue of Liberty. I booked the "Crown Tour" way in advance, which allows you to go to the very top, and it's really cool. I left the Marriot Marquis in Times Square about 9 AM, and returned to the hotel about 5 PM. So, to answer your question, the tour took the entire day. You are at the mercy of the ferries, which, in my opinion, do not run often enough--they crowd hundreds of people into each ferry to save costs, and they only run two per hour. It is illogical to stay at the Fairfield Inn. My favorite NYC hotel is the Eastside Marriott, it's in a nice, quiet area. The Intercontinental and the W are very close as well. I hope you can change your reservation. Are you interested in art? My favorite spot in NYC is the Cloisters with wonderful medieval art. That may be a better way to spend your afternoon. A second alternative is the Met. We have taken a tour of the US Mint, but I remember the tour was in the morning. My husband typically uses "town cars" rather than taxis for long distance in NYC. They are quite reasonable, and the drivers are really nice. We took one back to the airport on this trip. Husband is native NYC boy, so he knows best what to do. For such a concentrated visit, I agree that perhaps choosing a hotel in Manhattan in the downtown area near the sights you actually want to see might offer you a better experience and more effective use of your limited time. From your post, it sounds like you were hoping to do the sights on the 5th, your arrival day. By the time you left the airport, stopped at the Fairfield Inn, and then figured out how to get to Manhattan, the morning would be gone. What time is your international flight on the 6th? Depending on the time, staying in Manhattan would make it easier to do something in the morning of your departure day before traveling to JFK. One other question.... does anyone know what Terminal we might go out of at JFK. We are flying directly to Athens on Delta. Again... thanks for the replies! Pretty sure all Delta international flights leave from Terminal 4. Oh shucks -- with that flight time you definitely should stay in Manhattan. Good re the change. You might have to leave for the airport at 2pm or not much after that, since I imagine you want to be there by 3:30pm, two hours in advance of departure. So you do not have all THAt much time on the day of departure, but at least you have the entire morning. I'd take a cab or car service from your hotel. Price should be about $60 with tip using a service like Carmel or the like. That's what I paid a few months ago from my house to JFK. ( I never use routes that charge tolls, not in my car nor in a taxi.) Just give the driver the airline and he will know the terminal. The signage is great at the airport. Last edited by ekscrunchy; Apr 11th, 2019 at 02:51 PM. I fly Delta all the time out of T4. If you don't have TSA precheck, Clear, or Global Entry, the security lines can be 30-50 minutes. My friends checked luggage and it took more than 30 minutes to get through the drop-your-bag line before getting to the security check. Good advice on leaving the city early enough, afternoon traffic out to JFK is definitely an issue, at least it was for us. Just FYI, a taxi to or from JFK will cost $72 to $75 including tip, whether you go via Uber or car service or taxi. It can differ a bit, but I've never paid less than $70. If you can afford that two ways, then that's the easiest way to the airport from a Manhattan hotel. During some times of the day, it's not the fastest. You can save sometimes save considerable time in the mid-afternoon on a weekday (and especially on a Wednesday or Friday afternoon) by taking the Airtrain/LIRR or even the E Train/Airtrain to JFK. After 2pm, traffic really does pick up. Thanks.... I think we'll take public transportation to the airport. We only have carryon bags so luggage should not be a big issue. It looks like there's a subway station 0.30 miles from the hotel and it'll take less than an 1-1/2 to get to Terminal 4. Our subways & trains in NYC pretty much on time? We'll be heading to the airport on a Sunday. From WTC wouldn't it be faster to take the A train to Howard Beach station and not the E to Jamaica? The E will have to travel uptown through Manhattan then cut over to Brooklyn, while the A headed to JFK will be a more direct route. 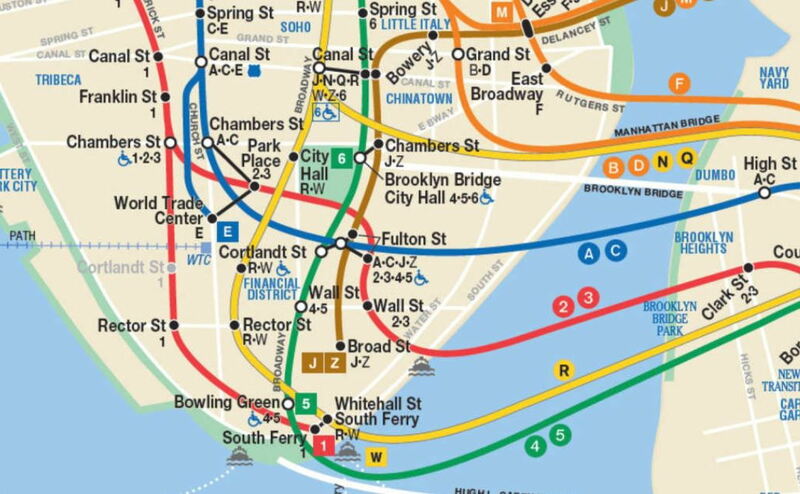 Be aware there are many different subway lines through lower Manhattan - not all stations serve all lines. Repairs and construction often take place on subway lines during the weekend. Check the MAT website for closures and delays during your brief stay. Spellchecker created a typo in my post! The MTA website is where you can learn about weekend delays! Do not count on subways being on time. I suggest booking the early guided tour of the 9/11 Memorial. It starts at 8-15am and costs $65/per person. Well worth every penny. Only about 30 people can take advantage of this tour each day. It is very quiet. I stayed around after the tour but was still out by 11:15. You can grab lunch and be on the way to the airport. Go the night before to see the outside fountains. Just thought of another tip. Purchase your tickets for the Statue of Liberty in advance and get the ticket that includes the pedestal or crown tour. It immediately puts you in a shorter line for the boat to the island. There is no additional cost for the pedestal tour. I cannot remember if there is for the Crown. Inside the pedestal is a museum on the making of the statue. I have seen many comments that this takes all day. Maybe I am a fast looker but I did the pedestal tour and the handset tour on Ellis Island and I was back in Manhattan in less than 4 hours. I went in mid October so maybe the time of year determines the boat schedule.